Chicken with peppers is one of the staple dishes you will see offered at traditional restaurants and it’s one of our favourites! 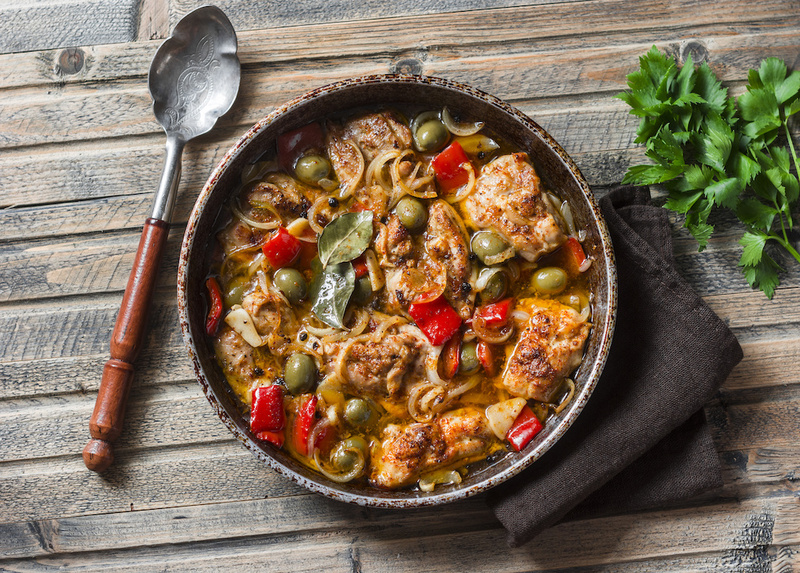 Pollo con Pimientos, as it is known here, is a savoury dish, full of local flavour. It’s taken us some time to work out how to cook it authentically, but we think we’ve cracked it, so try our recipe out and let us know what you think! The secret ingredient turned out to be vinegar! Put the chicken, onion, pepper, garlic and olives in a baking dish, then sprinkle four heaped teaspoons of paprika over, add a good glug of olive oil and 3 tablespoons of the vinegar. Mix the whole lot well with a large spoon. Put into a hot oven at 200 degrees and cook for about 35 to 45 minutes, stirring every ten minutes or so. The turn on the grill to maximum and just char the tops of the onion and pepper. You can serve the dish as a tapa with bread, or as a main course with rice or chips. Either way, you have to drink chilled white wine with it. It’s the law. More reading? Asadero de Pollos, the great Spanish take away.